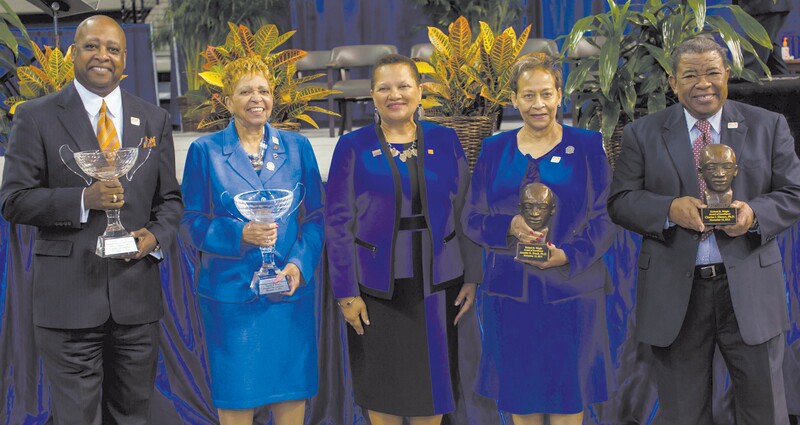 Percy Mack, Ph.D, Dorothy Wilson, Dr. Cheryl D Dozier, Annette K. Brock Ph.D., and Charles J. Elmore, Ph.D.
Savannah State University (SSU) continued the annual tradition of Founders’ Day on Thursday, November 12th. The observance focused on the history of SSU and its 125th anniversary. Awards were presented to four alumni. The Richard R. Wright Excellence Award, named for the first president, honors corporate or individual citizens, alumni and outstanding leaders, who have distinguished themselves through their expertise in social, educational and civic arenas. This year’s recipients were Annette K. Brock, Ph.D., and Charles J. Elmore, Ph.D. Brock, professor emerita, worked at Savannah State for 33 years as professor and administrator, including as interim president of SSU. Elmore, professor emeritus and historian, taught at Savannah State for 35 years, leading the Journalism and Mass Communication program to accreditation and reaccreditation. The Cyrus G. Wiley Distinguished Alumni Award recognizes outstanding alumni who exemplify the lofty ideals of SSU and demonstrate extraordinary support and loyalty to the university. This year’s recipients were Percy Mack, Ph.D., and Dorothy Wilson, each lifelong educators. Mack served as the superintendent of schools in Columbia, South Carolina; Dayton, Ohio; and as an assistant superintendent of the DeKalb County School System. Wilson is a retired public school teacher. She also volunteered with Greenbriar Children’s Center, the Department of Family and Children Services and served as the president of the Georgia Retired Educators Association.